It is my intention to write a more detailed post about my diabetes (and management) journey which began in 2006. Until then, here’s a short synopsis of my life with type 1. I’m sharing it now as this is a big year for me. 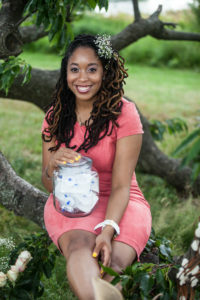 It’s my 10th year living as a diabetic– a milestone that recently sparked much reflection and also spurred a newfound commitment to myself and overall wellbeing. 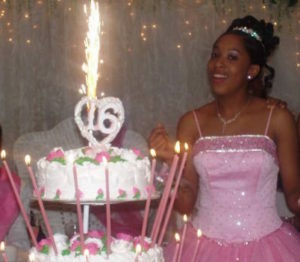 At my Sweet Sixteen, about a month after my diabetes diagnosis. This April marked my 10th “diaversary” (the anniversary of my diabetes diagnosis). When I was initially diagnosed a month from my 16th birthday, I stood bright-eyed and cheerful, relieved to have been finally given an explanation for my frequent urination and slender, but alarming frame. Unflinching in my resolve, I was not frightened by diabetes. My knowledge of its symptoms prompted a self-diagnosis before I set foot in the doctor’s office. I falsely assumed that if I could recognize its arrival, I’d have no problem adjusting to this new normal. Soon however, the reality of diabetes settled in and diabetes burnout thwarted my once gung-ho attitude. My management ebbed and flowed. Strings of favorable blood sugars and spot on carb-counting were met by seasons of excessive busyness that placed diabetes at the bottom of my priority list. I became a “lukewarm” diabetic. Though my control wasn’t remarkable, it was never bad enough to warrant deep concern from diabetes educators or endocrinologists. I was getting by. For a while this complacency stayed with me, only challenged on vacation breaks and seasons of rest where awareness that I wasn’t operating at my best prompted me to do better. Ultimately, it took my grandmother’s death from diabetic complications (type 2) two years ago to shake me from this cycle of coasting. Today, I’ve gained a newfound excitement for my diabetes journey, a journey now filled with compassion for myself and the highest commitment to my health needs.